Ocean Scooter is Shiny! Is Aerodynamic! Is Inflatable? The Ocean Scooter. 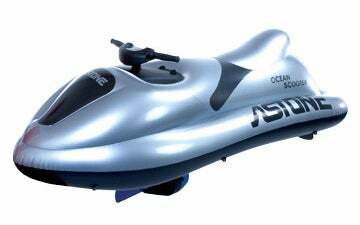 Designed to annoy everyone in the swimming pool and get you lost at sea with no possibility of getting back to land, this 12v/7Ah "battery powered inflatable watercraft" can travel at a swooshtastic 2.5 miles per hour and carry up to 165 pounds. It features an "aerodynamic design," dual air chambers made of PVC and, lo and behold, an on/off switch. The demonstration video after the jump can only be watched at 3 a.m. after a bottle of tequila and five bags of Flamin' Hot Crunchy Cheetos. At $395, I will stick to paddling on my inflatable rubber chicken.